Tired of boring textbooks and apps that don’t make sense? Step into the shoes of Dino, explore 4 German cities and learn German—the way it’s actually spoken—along the way! 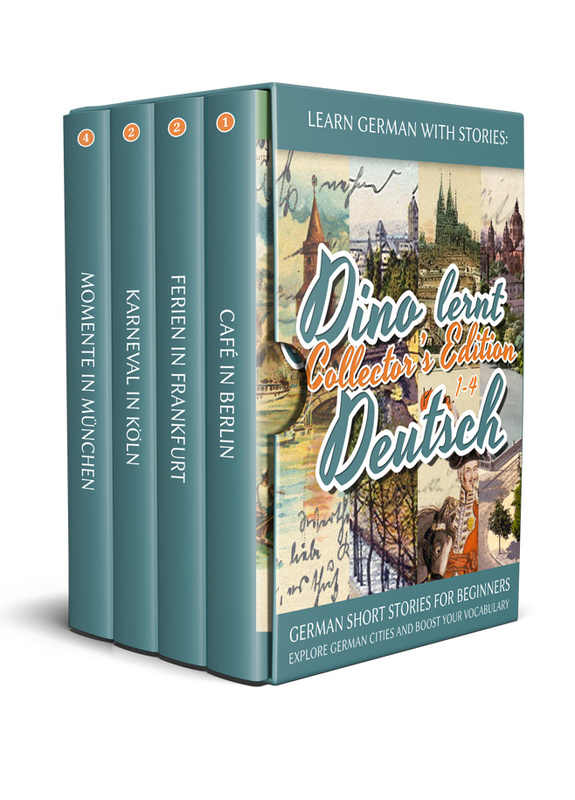 This collector’s edition comprises the first four German stories in the Dino lernt Deutsch German learning series for beginners: Café in Berlin, Ferien in Frankfurt, Karneval in Köln and Momente in München. Follow Dino on his adventures through 4 different German cities, experience daily life in Germany through the eyes of a newcomer, learn about the country and its people, and learn German effortlessly along the way! This book is designed to help beginners make the leap from studying isolated words and phrases to reading (and enjoying) naturally flowing German short stories. Just got started on your German learning journey? Memorized a few words but struggle with longer texts? We’ve all been there. This book is designed to help beginners make the leap from studying isolated words and phrases to reading (and enjoying!) authentic German fiction. Using simplified sentence structures and a very basic vocabulary, this story series is carefully crafted to allow even novice learners to boost their confidence and speed up their German learning journey. Each chapter comes with a complete German-English dictionary, with a special emphasis on collocative phrases (high frequency word combinations), short sentences and useful expressions. By working with these building blocks instead of just single words, learners can accelerate their understanding, boost retention and active usage of new German language material and make the language learning process more fluid and fun. Yes! That’s right. Once you’re done reading the four episodes contained in this collector’s edition, the story continues! Follow our protagonist to Palermo, Zurich, Vienna and many other cities in the next installment! Before you know it, you’ll have traveled half of Europe and picked up more German than years’ worth of expensive courses.